Species comes from the creative mind of H.R. Giger who was also responsible for the Alien creature. The year is 1974 and an elite group of scientist are transmitting the outlines of human DNA into the far reaches of space in their search for Extra Terrestial Intelligence. A few years later they recieve a reply detailing how to splice an extra terrestial DNA sequence with human DNA. The result is SIL, a hybrid female who looks like a normal human but can morph easily into her alien form. SIL grows at an incredible speed and her regenerative abilites, incredible strength and intelligence become a threat to the group and therefore decide to shut her down. SIL however is not so easily "dumped" and escapes the government facility where she has been kept, on a mission to mate with a human male. 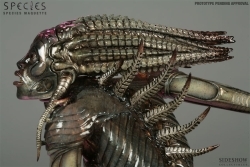 Paying homage to the creative genius of Giger is no easy matter and capturing the essence, beauty and aura of these creatures in sculpture is no easy task. But the talented artists and sculpters from the Gore Group have surmonted the impossibble to bring you the Species Maqutte. No detail, however small, has been spared to bring this truly authentic and highly detailed represented of SIL. In order to perfectly re-create the Species character and essence a double-layered sculpt was created to add realism and accuracy to the sculpt. Once complete the sculpt was then handed over to Sideshow Collectibles head paintewr Anthony Mesta to complete the pieces look and feel right down to the most minute detail. Due to the translucent nature of the Species physiology painting SIL was a big challenge and in order to re-create the look achieved on screen a clear cast outer torso and face was created with seperate opaque components used as a foundation for the paint to give a real depth to the characters look. Both the inner torso and face were painted using various shades of transluscent paints to give a true feel of depth to the sculpt. Despite the inner surface not being fully visible it has been fully rendered both in sculpt and paint so that once the piece was assembled the otherall effect of the paint and clear elements along with ambient light make for truly dynamic and unique maquette.